Judge Thomas Burke, J. D. Lawrence, M. F. Barkus, C. W. Treat, and E. F. Palm (sp/?). 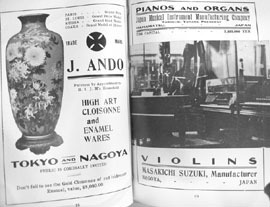 While Yamaha and Suzuki would eventually start making things other than pianos and violins (for instance, motorcycles and automobiles), J. Ando & Co.安藤七寳店 has stayed with its original products down to the present day -- cloisonne enamel wares, made by firing colored glass onto a metal body, with each colored area surrounded by a wire dam or "cloison" that keeps the glass colors from running together when heated to the melting point. Ando cloisonne vases, plates, etc., are still being made; early examples fetch ever-higher prices on Ebay and at antique shows (http://www.ando-shippo.co.jp/). 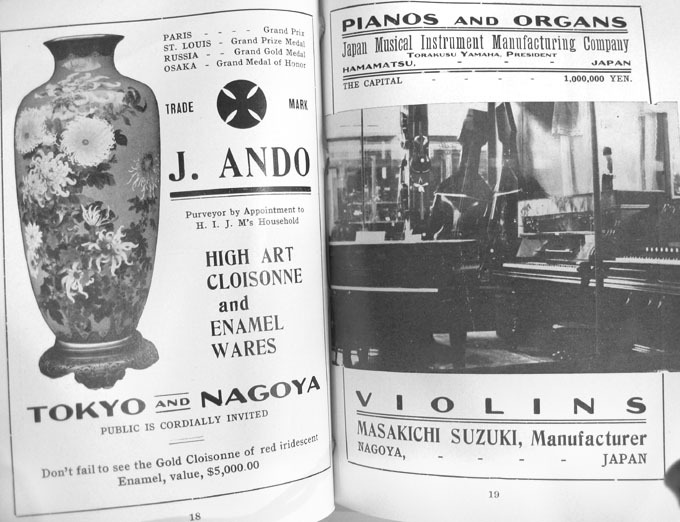 By a lucky chance, we have not only an advertisement for Ando's wares in the official pamphlet for the Japanese exhibit at the AYP Exposition but also a photograph of an exhibit case showing Ando cloisonnes in the building that housed the Japan exhibits. Seattle area, it may well have come from the AYPE. …an enormous red and gold enameled cloisonne vase, a masterpiece of Japanese art… The vase was the most valuable of the gifts accepted by the president. A beautifully leather-bound petition from Baron K. Ohara, minister of agriculture and commerce, presented by H. Ota, director general of the Japanese exhibit at the exposition, besought him to accept it. It had been one of the features of the Japanese exhibit and is valued at $5,000. The vase is 26 inches high and the masterpiece of J. Ando, who spent eight years in making it. The petition was presented to the president as he came down the stairs in the New York building just before the luncheon. Addressing his remarks to H. Ota and a delegation of Japanese from the Seattle Japanese Association, the president accepted the gift and said that it would be given a prominent place in the White House in Washington. The vase had been the centerpiece of Ando's exhibit in the Japanese Building. The advertisement shown above exhorts readers "Don't fail to see the gold cloisonne of red iridescent enamel, value $5,000." The tone of the PI article may be slightly disapproving. Taft had been offered many gifts during his tour of the AYPE and accepted (and kept) most of them, including a large garnet and one or more gold nuggets. The Ando vase was worth the most money, however, and it did not help that it was clearly being presented by a foreign government rather than a locally based group like the Seattle Japanese Association. $5,000 would have been a meaningful good-will gift. In 1909, it was ten times the annual salary of an average American schoolteacher. 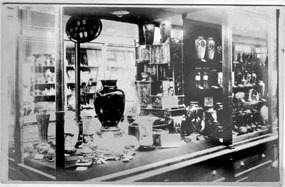 As noted elsewhere in this website, the Japanese Association had given him a copper-alloy vase at the AYP Exposition, while the Seattle Chinese communuty had given him a pair of needlework portraits of himself and Mrs. Taft, stitched by under-twelve children in southern China. Although both of these gifts may have been appreciated by the President, neither came close to the Ando vase in value. 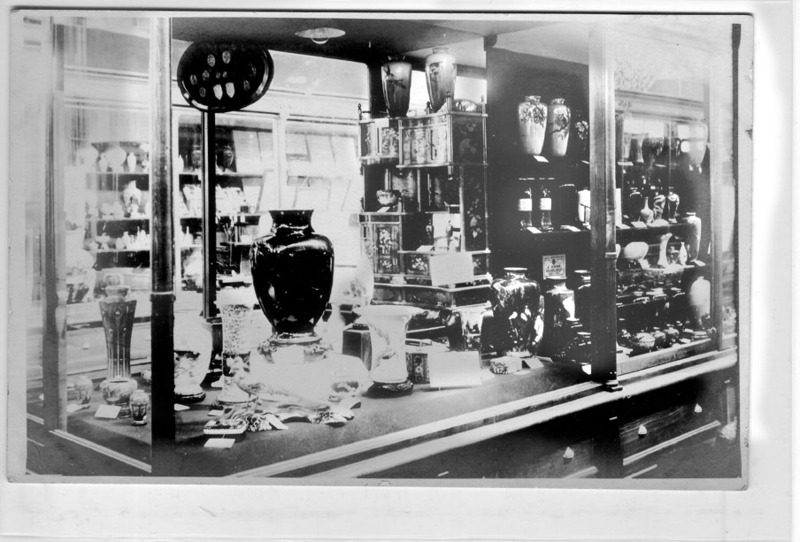 The largest cloisonne (or plain enamel) vase in the Ando exhibit pictured above. It may be the one given to Taft. A member of the family that founded the company sent this to us. 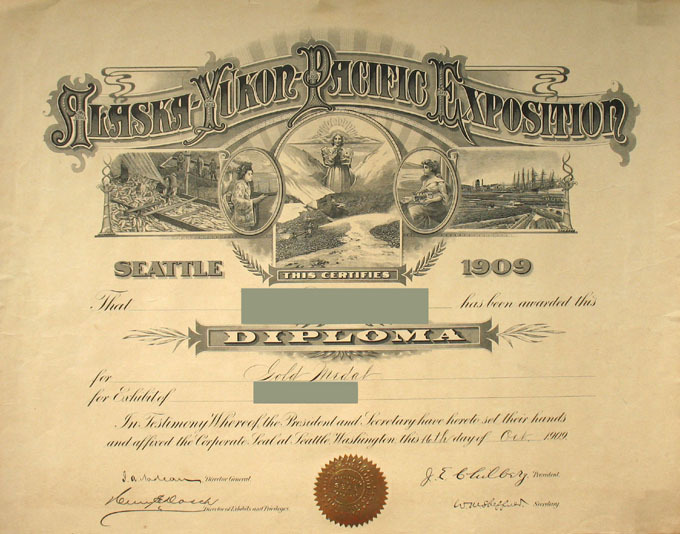 The company had already won awards at several other world fairs by the time it showed its products at the AYP Exposition. Not many of those other awards can have come with certificates whose engraved imagives spoke so plainly about the purposes of the fair. The images below are from the center of the certificate. 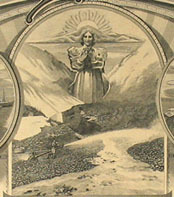 They illustrate the commercial themes of the exposition as well as the three ladies who symbolize Alaska, the Northwest, and the Pacific. In this version, the Alaska lady -- the blonde holding the outsize gold nugget and rising from a hole in the valley floor -- is less inspiring than terrifying. If we were the hydraulic monitor operators in the foreground, we would be running for our lives. Outlawed by California in 1884, mining with high-pressure monitors and hoses continued to be legal in other western states until after WW II, and is still practiced in Southeast Asia. It is an effective but environmentally destructive method for recovering heavy metal ores from sand and gravel deposits and even from solid rock. In spite of a long-standing rivalry, Masajiro Furuya joined with C. T. Takahashi and Tetsuya Arai to support the creation of a Japanese Village, the so-called Streets of Tokio, on the Pay Streak of the AYP Exposition. Arai had bid successfully for the Japanese Village concession but needed financial support. While stylish and able to work smoothly within the American system, he had less money than Furuya and Takahashi. 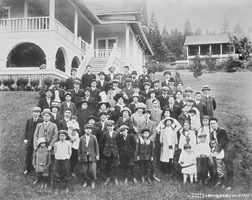 Moreover, as leaders of the American Japanese community in Washington State, all three were concerned to see that the Village would do well in the eyes of the white majority and of officials back in Japan. Their solution was an ad hoc corporation, the Kyosan-Kai. 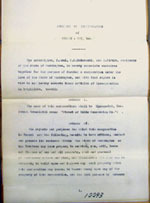 The three principals, designated as the trustees of the corporation, signed the necessary documents on January 16 1909. 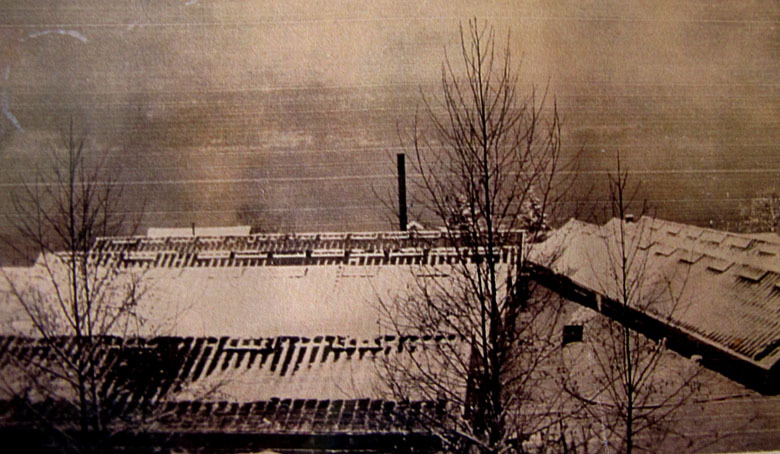 Although work must have already begun on the buildings of the Village, the corporation would provide the legal and financial foundation for the buildings, furnishings, and management. The Kyosan-Kai was to have $25,000 in capital, divided into 2500 shares, each with a par value of $10. This was inexpensive enough for many members of the Japanese community to buy a share or two. We assume that a number of them did, although either Furuya or Takahashi could have provided the whole $25,000 without undue strain on their own finances. After the Fair the Streets of Tokio turned out to have made a small profit. We do not know whether the investors were repaid. 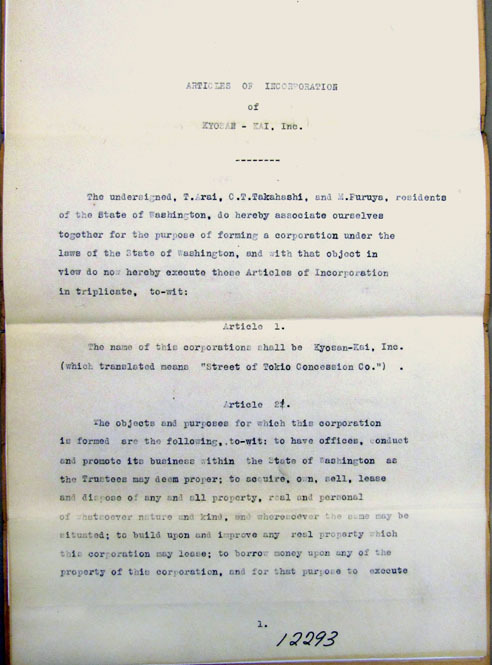 First page of incorporation document, Kyosan-Kan Inc. 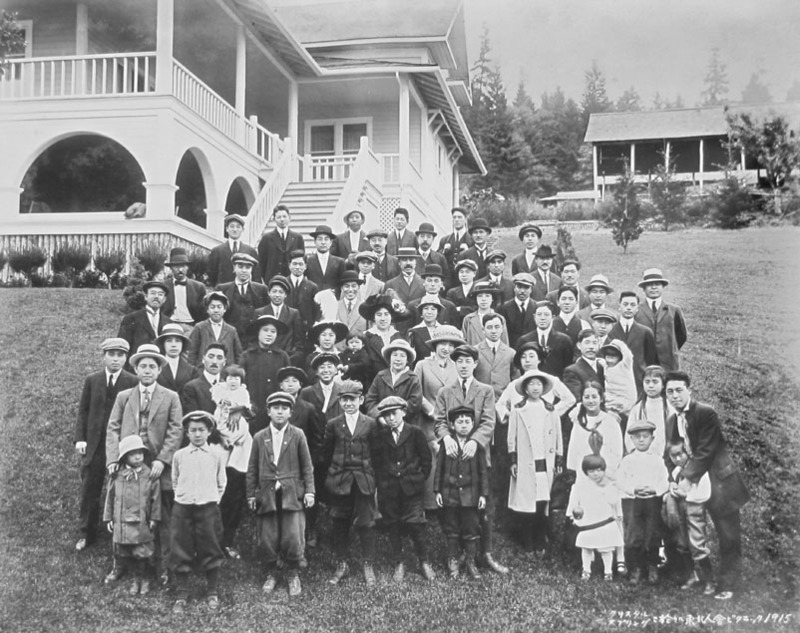 In 1905 Masajiro Furuya, a merchant and banker who later became a key supporter of Japanese-American efforts at the AYPE, built a summer home for himself in the Crystal Springs area of Bainbridge Island, across Puget Sound from Seattle. Astonishingly, the home still exists. 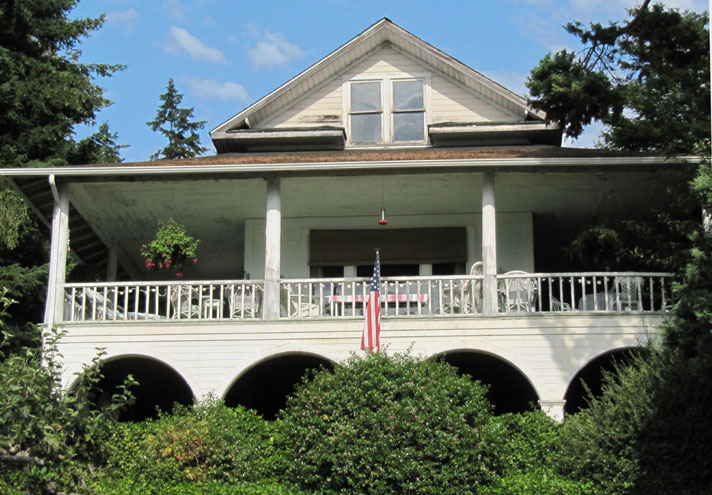 With the original exterior and interior still intact, it is probably the best-preserved early single-family home built by an Asian-American anywhere in the Pacific Northwest. 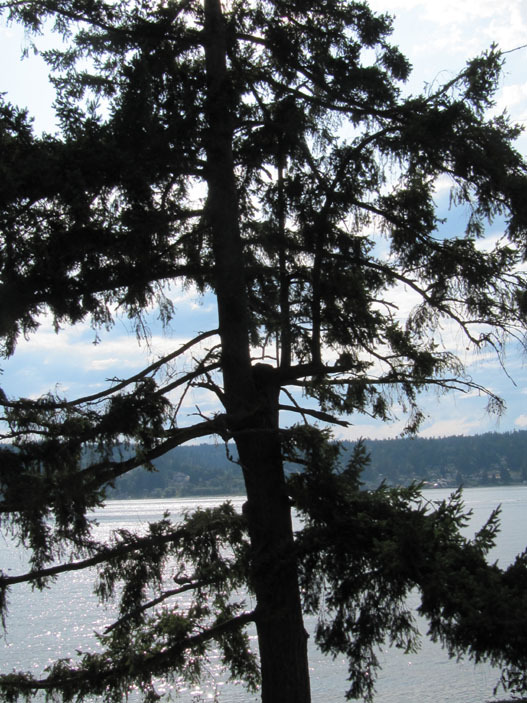 The dominant feature of the building is the massive verandah that surrounds it on three sides, overlooking Port Orchard Bay and the lawn that slopes down to the waterside. Without the verandah and the sheltered space underneath, the house would be quite small, especially because the second floor has never been finished or used. Furuya, a devout Christian, lived very modestly back in Seattle. 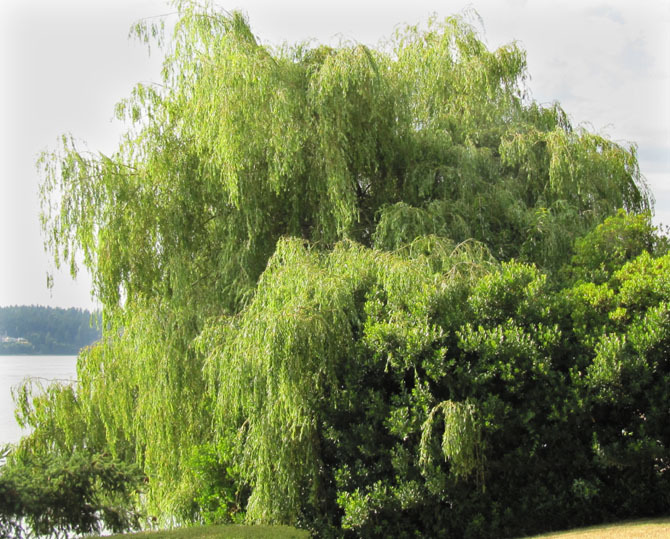 Apparently he chose to live the same way on Bainbridge Island. 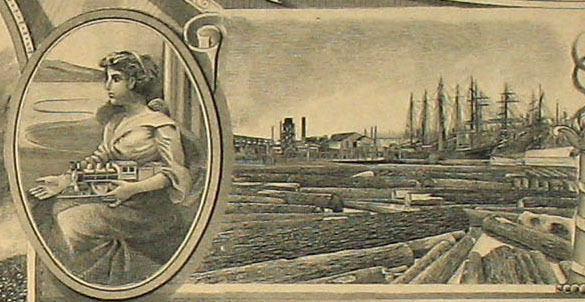 Even though Bainbridge Island was the home of two massive sawmill operations at its northern and southern end, other parts of its seacoast were already being colonized by wealthy Seattlites who, like their counterparts in most other American cities, felt a need for elaborate summer homes, often called lodges or cabins but very luxurious in spite of that. Furuya, as wealthy as many upper class Seattlites, evidently wanted to fit in. His problem, one imagines, was that his tastes ran to a simple and even ascetic lifestyle. His answer seems to have been to treat his summer house differently. He did use it as a part-time home for himself, his wife, and his two daughters. 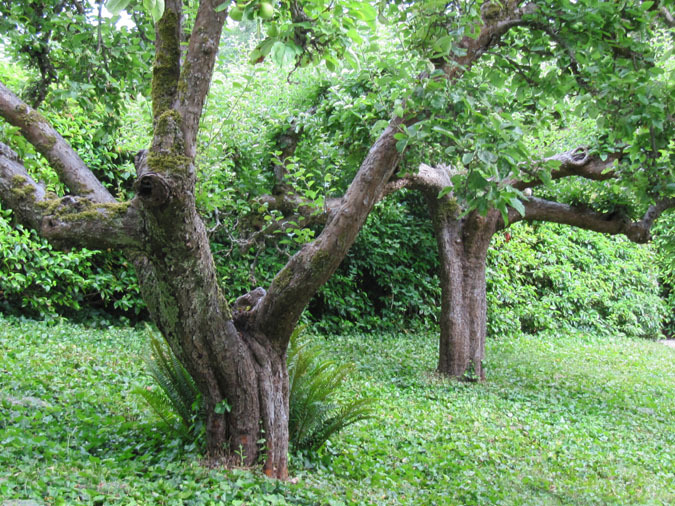 However, it had other important functions: as a gathering place for selected employees and other members of Seattle's Japanese American community, and as a private agricultural experiment station (see below). 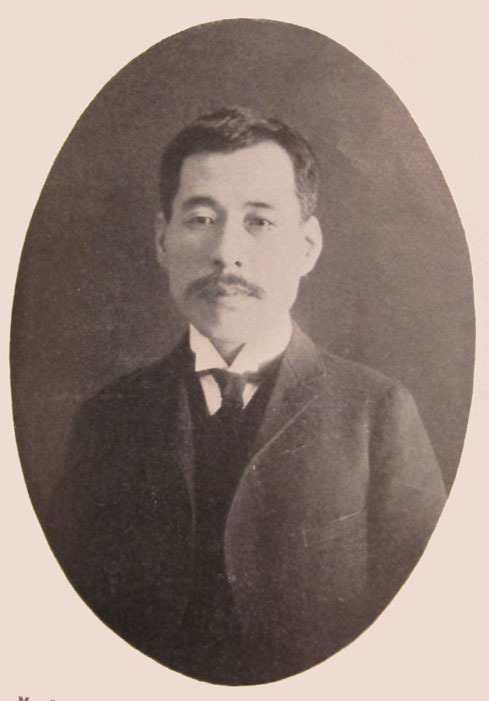 Due to the bankruptcy of his businesses, Furuya was obliged to sell the house and land in 1931-32. It is now owned by Frank and Michele Whitman, who maintain it with exemplary care and with full consciousness of its historical importance to Japanese- and other Asian-Americans. As was common in upper-class resort buildings of the time, the Furuya house was built entirely of wood inside and out. 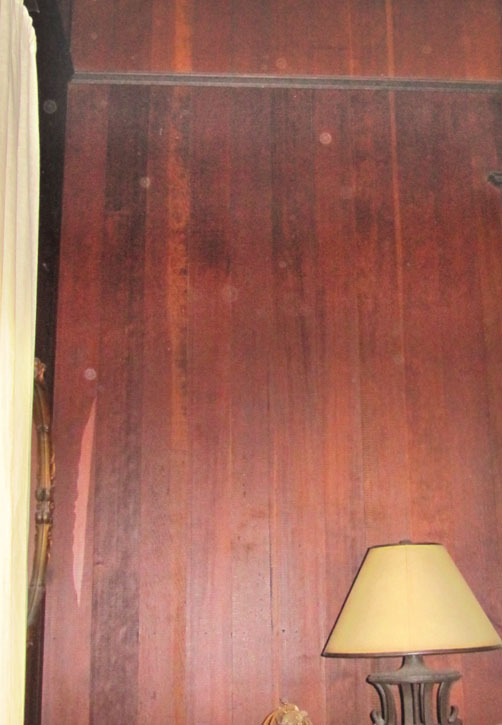 There is no plaster or wallpaper inside -- the walls and ceiling are lined with closely fitted straight-grained Douglas fir boards, said to be from the nearby sawmill at Port Blakely where Furuya had once sought and been denied a job. 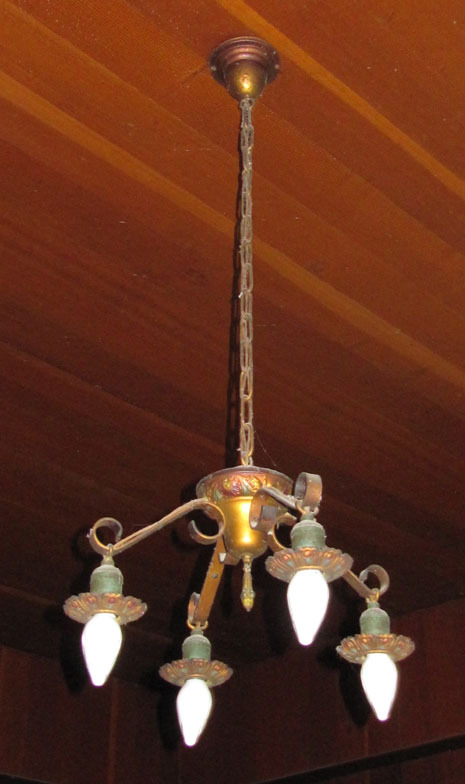 Not only do the boards still have their original brown-stained finish but much of the hardware too is original: door fittings, window glass, and chandeliers. Furuya House 1915: Outing for Seattle Japanese, probably Furuya employees. Furuya House, 1910-1920. Steam-heated hothouses and greenhouse on hill above the residence. (long-blooming), snowball viburnum, sweet william, trumpet vine, and wisteria. However, most of these were introduced by Westerners who went to China or Japan and brought them back. Flowers and trees that were personally introduced by Asians are much rarer, and in almost no case do we still possess the original plant specimens that were thus intrioduced. 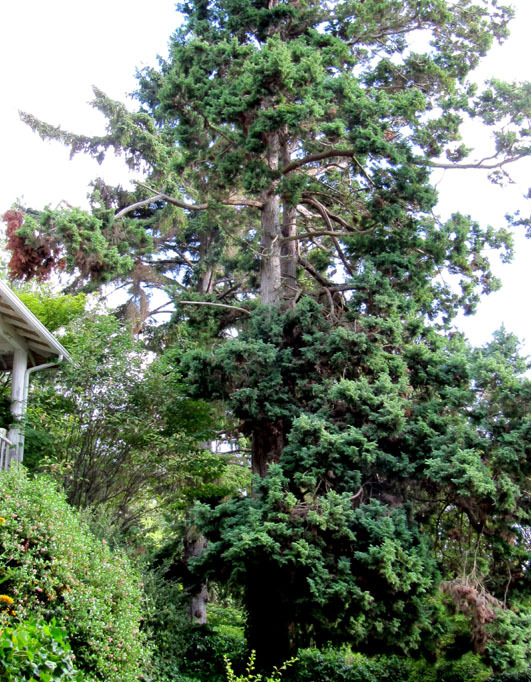 This lends particular importance to the trees still growing around the Furuya House on Bainbridge Island. Furuya was an ambitious plant importer, who experimented with numerous Japanese varieties that he hoped might do well in the Northwest. His experimentation with bamboos, under the supervision of "T. Tujiwara" [Fujiwara? ], received a good deal of publicity at the time [note 1]. 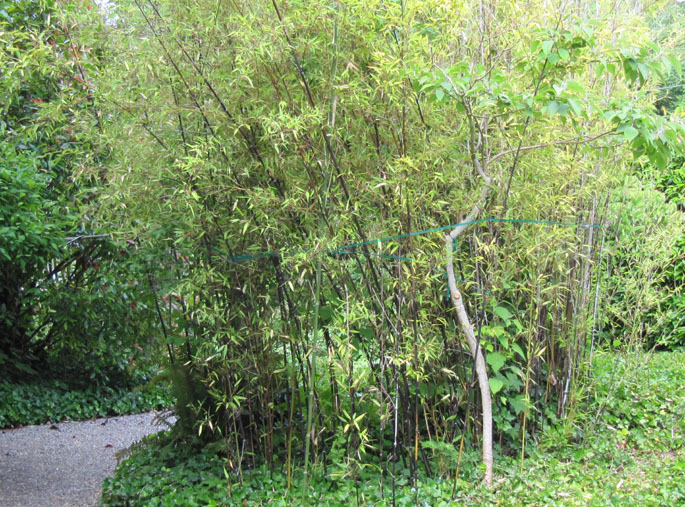 Furuya even seems to have toyed with the idea of introducing large-diameter timber bamboo. According to contemporary newspapers, he also introduced udo (Aralia cordata) and types of soybeans suited for making soy sauce [note 2]. 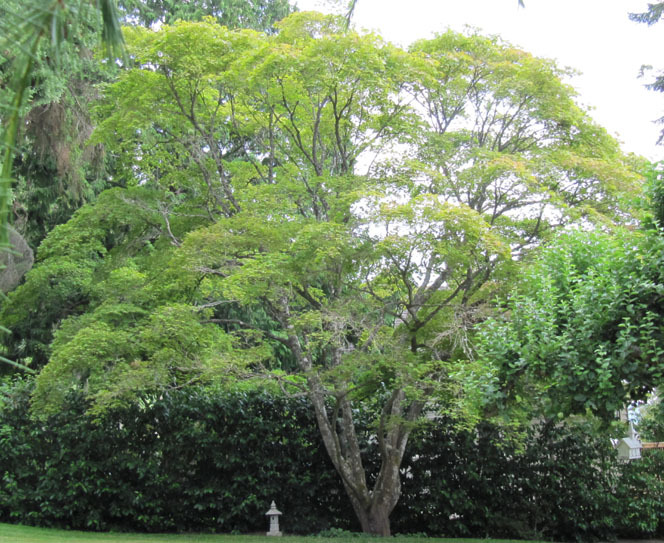 What interests us here is the fact that many species of trees were imported by Furuya and that large trees of some of those species are still growing on the grounds of the former Furuya estate. Visitors may still see them, although sadly, a pair of paulownias had to be taken down several years ago. 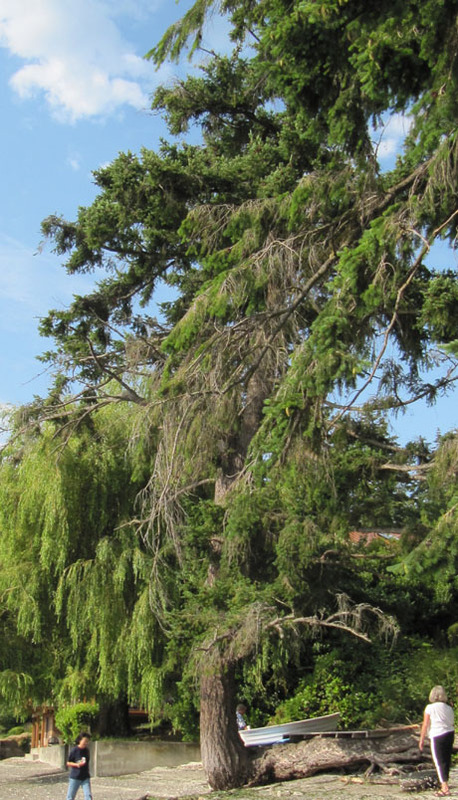 Such visitors will undoubtedly join the editors in admiring what are probably the oldest surviving individual plants in the Northwest to have been imported or tended by a person of Asian birth. 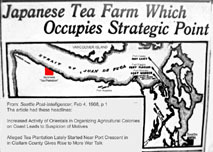 "It was recently pointed out that the defenseless condition of the [Puget] Sound below Point Wilson really renders the big forts near Port Townsend ineffective, for the reason that a landing party at Dungeness [25 km or 15 mi to the west, nearer the Pacific] can come overland and, by a rear attack, take Fort Worden. Once in possession of that formidable defensive work, they can speedily silence the guns of Forts Casey and Flagler, thus providing free access to Puget Sound for an invading fleet. The idea that most male Japanese laborers in North America were highly trained ex-soldiers, veterans of either the Sino-Japanese war of 1895 or the Russo-Japanese War of 1904, was common in contemporary anti-Japanese propaganda. While it seems unlikely that the Japanese government would actually have let so many of its experienced troops leave Japan, paranoid white Americans believed that this was so. The belief must have played a role in discouraging violence against Japanese immirgants. We do not know whether the Japanese actually tried to grow tea on the hillsides overlooking the Strait, or whether this is even possible. 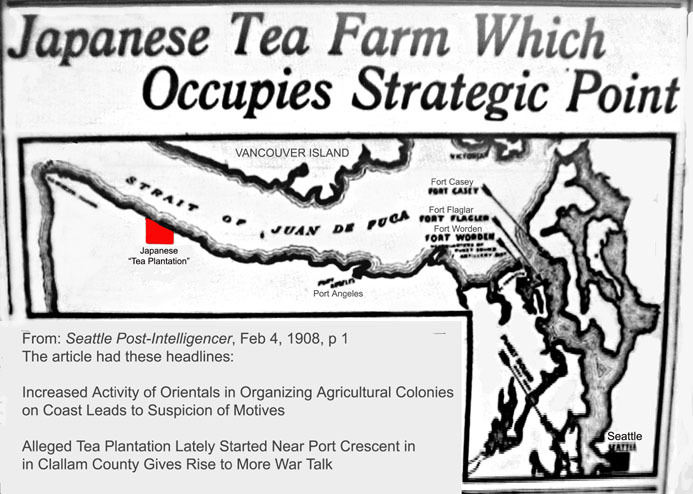 If any of our readers know about Juan de Fuca tea, we hope they will get in touch with us, the editors.